TRANSFER AMCK (single insulated wire pairs, cross-braided screen, highly flexible PUR-Blend jacket). As connectors we use two TOURLOCK multipin sockets (with protective caps). All multipairs shown here are equipped with separate grounding as standard. We have fitted a 10 cm unshrunk transparent shrink-on tube at both cable ends for your personal labelling. For the QM-versions we use our highly fl exible QUANTUM tailored for use in stage areas (stage sub-distributions). 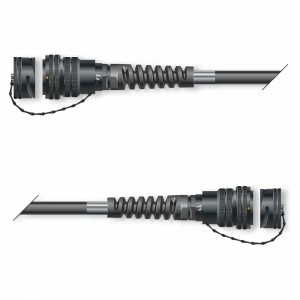 This cable can be reeled easily on your hand and fi ts nicely into every corner on stage. By using the optionally available extension adapters (also nicknamed “spookies”), 2 x female-female cables can be linked as well. by fax or e-mail under support@sommercable.com. Complete with multipin protective bag!